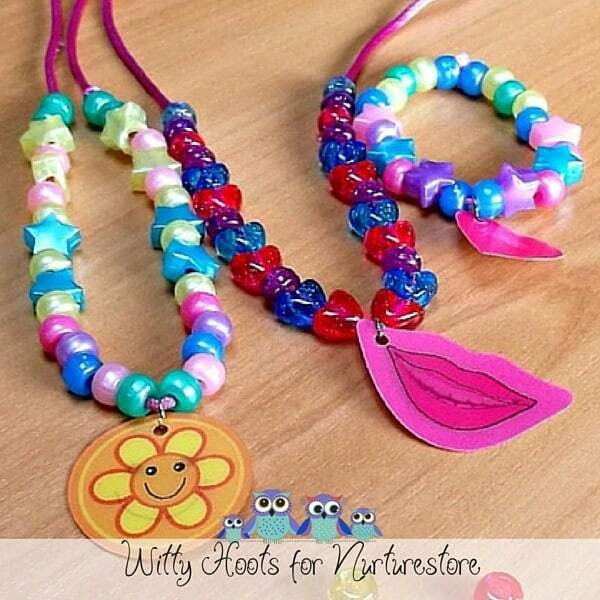 Please welcome Helen from Witty Hoots who joins our ABCs and 123 series with this idea that combines a pretty jewellery craft for kids with a hands-on math lesson in repeating patterns. Recognising and creating patterns are essential mathematical skills that are not only fun, but also foundational for other math skills such as sequencing and understanding time. They can also be important in music, science and art. We decided to make jewellery which included repeating and reverse patterns. The beauty of this activity is that it can be adapted to all ages, from simple patterns using large beads with preschoolers to more complicated craft patterns for jewellery for older kids. 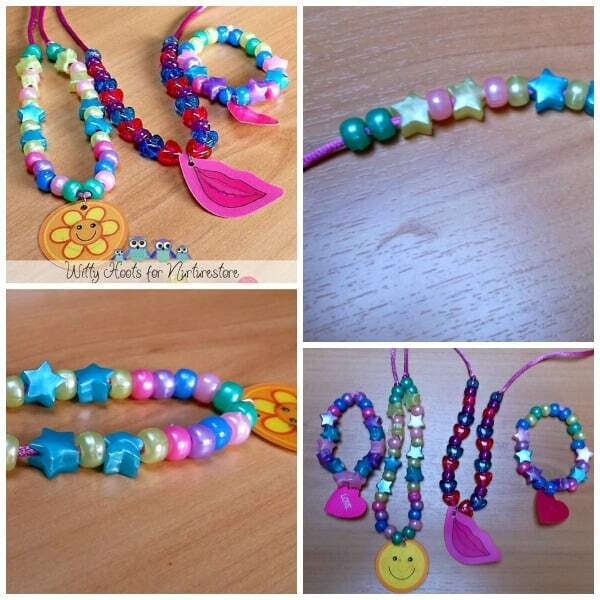 This activity involves the use of beads which may be a choking hazard, in particular for younger children. You should carefully consider whether this activity is suitable for the children under your care. You should also closely supervise children at all times during this activity. Before you start making your jewellery think about the age and ability of your child, their manual dexterity and their current pattern recognising abilities. 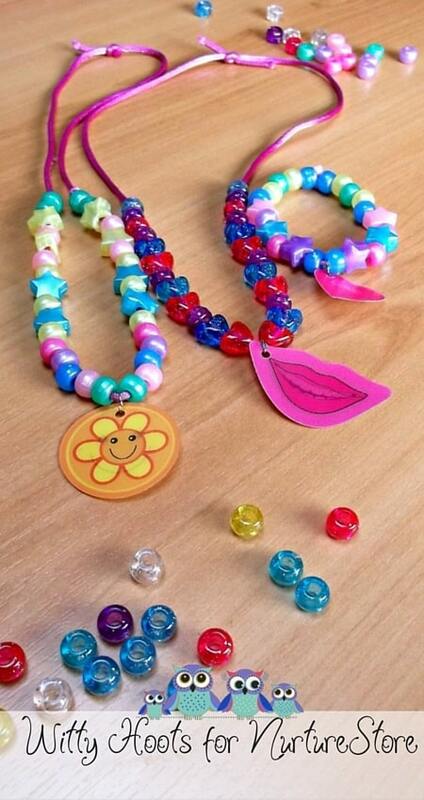 You will find that younger children are still developing fine motor skills, so try using larger beads and perhaps a plastic threading needle. Also, younger children will probably enjoy just threading beads onto the cord. Let them play and then point out a simple repeating pattern such as blue bead then red bead then blue bead and see if they can guess the next colour. If you do not have any large beads why not try threading painted pasta shapes. As always be careful if you decide to make a necklace with a youngster and supervise them at all times. We tend to make bracelets or key rings instead. There are many different ways that you can introduce patterns into your jewellery making with older kids. Take into account their likes and dislikes, do they like making and wearing bright fancy jewellery or using darker colours? Or are they making a gift for another person? Using materials that they like or creating something for another person can help keep children engaged. We have been making simple pattern sequences with beads for a while with our school age daughter and she now can make quite complex patterns with different coloured or shaped beads. This time, I decided to see if she could do some reverse repeating patterns with some coloured beads and a pendant. First, we placed the pendant on the cord and positioned it in the middle. Next, we added a variety of different beads to one side of the pendant. Then, she threaded the same beads on the other side as a reverse pattern. Soon we had lots of different necklaces and bracelets and a daughter who now recognises patterns in other things ‘just like the necklaces we made’! Here at Witty Hoots, we have also been looking at encouraging youngsters to take their own Country Walks Photographs, trying out Maths Magic to Amaze our Friends, and we host a monthly Quirky Blog Hop packed full of interesting ideas, recipes and activities for the whole family! I’m Helen, business woman, blogger and a former baby signing teacher too! I write these activities and educational posts in the Family Section of Witty Hoots. I also write educational and craft posts on Peakle Pie which is aimed at the younger members of the family! We would love you to visit our site Witty Hoots and share more great ideas with you!